When you have a special occasion coming up, it’s a nice thing to have a special dessert to serve to your family and friends. 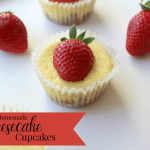 These homemade cheesecake cupcakes fit the bill because they look very fancy, but are actually pretty easy to make. But you don’t have to save this dessert only for holidays…these are so much fun to make for your kids too, because they love having their own cupcake all to themselves. The whole recipe only takes about half an hour to make, but the results are delicious! Preheat oven to 325 degrees and line a muffin pan with paper liners. Combine graham cracker, butter and sugar in a small bowl. Texture should be similar to wet sand. Divide crust mixture evenly into the bottoms of muffin tins. Bake for 5-6 minutes or until golden brown, allowing to cool completely when finished. Add in sour cream, sugar, eggs and vanilla. Mix until combined. Pour cheesecake mixture into cooled muffin tin. It will be about 2 tablespoons of filling each, filling almost completely. Bake for 20 minutes or until the cheesecakes are set. They will still jiggle a bit. But that is ok; they will cook as they cool. Allow them to cool in the muffin tin completely. Place in the refrigerator to chill and serve cold with your favorite topping. For the Homemade Strawberry Sauce: Add strawberries, lemon juice and sugar to a small saucepan. Simmer on low for 15 minutes, mashing up strawberries with the back of a wooden spoon. Remove from heat and allow to cool. Using a food processor or blender mix until creamy and thick. Place back in the fridge and serve cold. Gather your ingredients together…cream cheese, sour cream, butter, sugar, vanilla, eggs, lemon juice, graham cracker crumbs and strawberries. To begin, you’ll want to make the crust for your cheesecakes. Combine the graham cracker crumbs with the sugar and butter, place in your muffin tin (you’ll want to use a muffin liner), and bake. 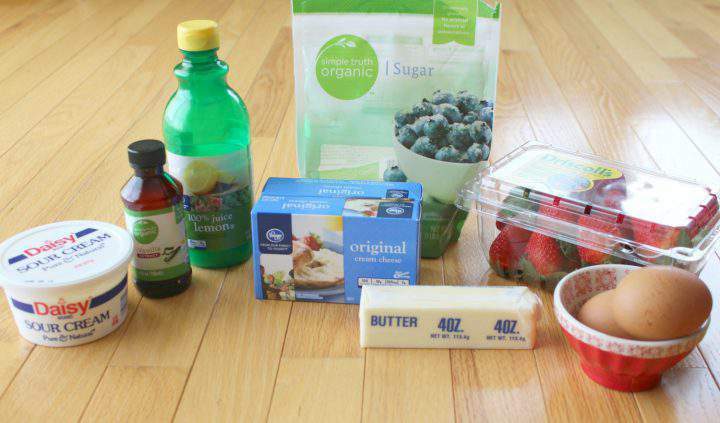 For the cheesecake mixture, combine the remaining ingredients (except the strawberries) in your mixer and beat until smooth. Pour the filling into the cooled cheesecake crusts, filling each cup almost to the top. Bake for about 20 minutes, or until the cheesecakes are just a bit jiggly in the center. They will firm up as they cool. 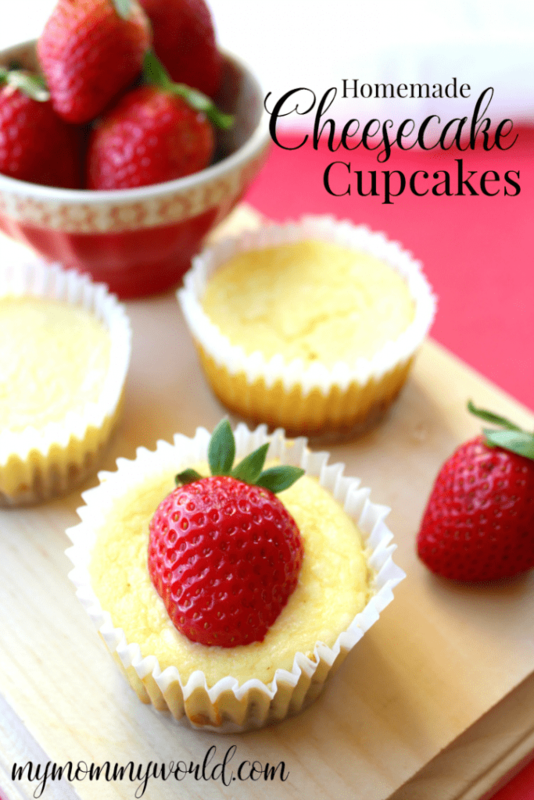 While the cheesecake cupcakes are baking, you can make a simple strawberry sauce with strawberries, lemon juice and sugar. Simply cook together for about 15 minutes in a saucepan, mashing the berries to help them break down. It’s best to serve the homemade cheesecake cupcakes cold. They are great with the strawberry sauce or simply with a sliced strawberry on top as a garnish. These little beauties are great to take to a potluck or to just enjoy at home with your family. One thing I know is that they won’t last long! What is your favorite cheesecake topping? Theses look really yummy. I really like cheesecake. I’ll have to make these for my family with dairy-free substitutes. I’m sure they would love them.